This is the fourth and final installment of this post on the introduction of electric power to Los Angeles and Boyle Heights by Rudy Martinez, Advisory Board member of the Boyle Heights Historical Society. Research included scouring online newspapers, poring through many articles and books, and diligently searching through public archival records. Thanks, Rudy, for the expended extensive effort, which resulted in this very interesting post. Finally, tomorrow night, December 31, marks the anniversary (the 132nd) of the switching-on of the first Boyle Heights electric light! Through the rest of the 1880s, several more electric light masts would be built in Boyle Heights. The Los Angeles Herald, on July 4, 1887, reported that a newly-erected, 185-foot light mast at the corner of New York (now New Jersey) and Soto streets, was the tallest in the city. Though it is difficult to ascertain exactly how many light masts were eventually installed in Boyle Heights, an article (endorsement?) in the Herald on February 16, 1889, in discussing Edward R. Threlkleld's run for reelection for the city council's Ninth Ward, listed among his achievements, the securing of six electric lights (not including the First and Boyle mast) for Boyle Heights during his time in office. The article listed the location of each light mast. A Los Angeles Herald article from February 16, 1889, promoting what city council candidate Edward R. Threlkeld, a Boyle Heights resident, "has done for his ward," including six electric lights sprinkled throughout the neighborhood. However, the Los Angeles Times on May 25, 1889 reported people in the area of Macy Street, near the covered bridge [covered in a previous post on this blog—link here], were complaining that no lights had yet been placed on a recently-erected mast and that “the vicinity is in very bad condition.” It is undetermined if the lights were eventually placed. The First and Boyle light mast also distinguished Boyle Heights as being one of the handful of seventeen existing light masts to be located, along with their elevations, in a table that was the result of an on-going geodetic survey conducted by the United States Coast and Geodetic Survey (known today as the National Oceanic and Atmospheric Administration) and published on August 1, 1885 in the Times. The August 1, 1885 edition of the Times included a table showing the location of electric light masts in Los Angeles, including the one in Boyle Heights at Aliso and First streets, based on "the distance the lights can be seen at sea" as part of work conducted by the United States Coast and Geodetic Survey. Practically speaking, the light masts were never fully successful and had a reputation of unreliability. There were continued complaints that lights often burned out, and the company in charge was slow to replace them. In fact, within a few months, a new problem that was unique to this new technology soon came to light, so to speak – the Herald in June 1884, began to report the large number of dead moths collecting in the globes of the light masts, so numerous at times that lights would go out. Also, heading into the turn of the century, many major cities including Los Angeles began to rapidly build skyscrapers that would literally overshadow the light structures, making them impractical for street lighting. Eventually, smaller light posts closer to the street and lamps suspended by several wires above the center of an intersection, both lighted by the superior incandescent light, became the standard. This image by C.C. 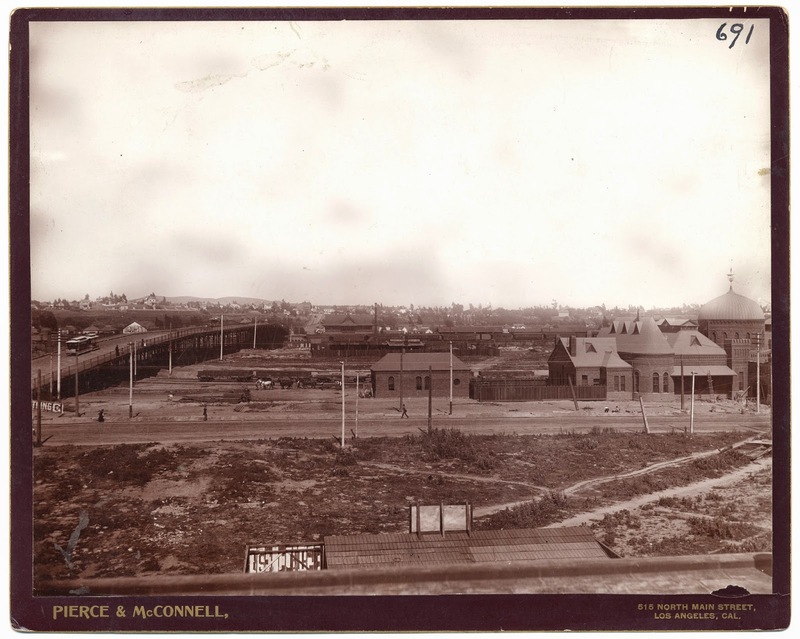 Pierce and Abiram E. McConnell from about 1895 shows the new LaGrande Station of the Atchison, Topeka and Santa Fe Railroad in the foreground, the First Street bridge with the Los Angeles Cable Railway line on it at the left and, in the distance, Boyle Heights. Go to the photo below to see a detail showing the electric light mast at 1st and Boyle next to the Cummings Block. Click on the image to see it enlarged in a separate window. Courtesy of the California History Room, California State Library, Sacramento, California. In San Jose, there is a 115-foot replica of the original moonlight tower at History Park. In San Francisco there is a plaque where the first central electric station was located. The history of Detroit’s once-numerous moonlight towers is well documented, though there are none remaining. However, in 1894, the city of Austin, Texas purchased thirty-one of Detroit's original moonlight towers, and seventeen still stand today as registered historic landmarks (the towers are mentioned in the film, Dazed and Confused when Matthew McConaughey calls out, “Party at the Moontower!”). Finally, in Cleveland, Brush's name lives on at Brush High School where the team name is the Arcs. This detail of the above ca. 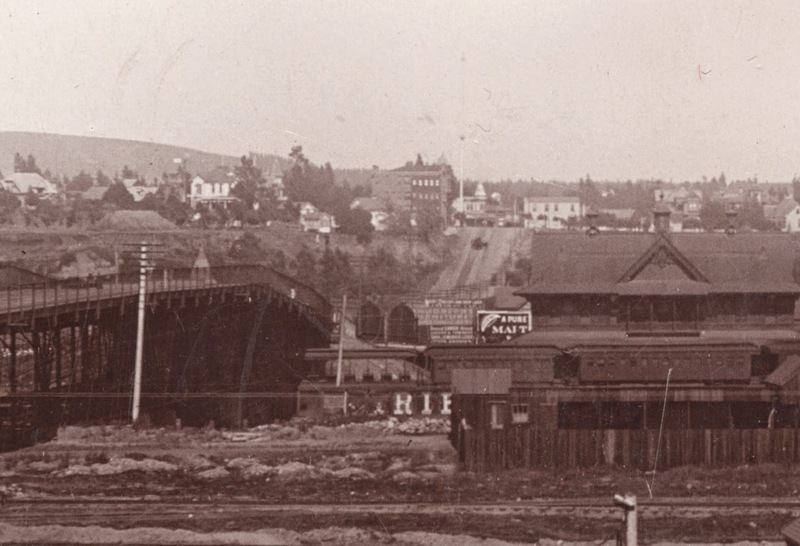 1895 Pierce and McConnell photo shows the 1st Street bridge crossing the Los Angeles River, the street climbing the Paredon Blanco (white bluff), the Cummings Block, which still stands at the northwest corner of 1st and Boyle Avenue, and, just behind the building, the tall white pole of the electric arc light switched on at the end of 1882. Click on the photo to see it enlarged in a separate window. Courtesy of the California History Room, California State Library, Sacramento, California; only a portion of the entire image has been used. As for the father of Los Angeles’ first electric lights, Charles Howland and his business associates helped establish the Los Angeles Electric Railway in 1886, as well as purchasing a 280-acre tract by Rosedale Cemetery that they named the Electric Railway Homestead Association. More a speculator and salesman than an inventor, Howland never really knew as much as he could have about electric light, or railway technology. Until now, little has been known about the history of the eight-story light mast that once stood in the area that is now popularly known as Mariachi Plaza and helped usher Los Angeles, and Boyle Heights, into the new age of electric power.